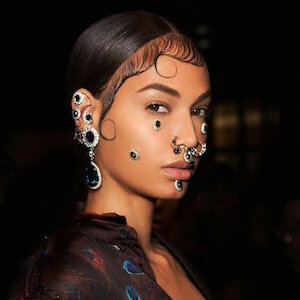 Is Face Jewelry the New Flash Tat? At an event a few weeks ago, I noticed some girls with jewels on their faces, admittedly scoffed at it, and figured this was just some gimmicky thing the event presenter put on (“Come by the Bud Light Lime face jewelry booth for a buzz and a bedazzle!”) and not a new trend I needed to be concerned with. But then I saw it at Fashion Week and was like, oh ok. PASS ME MY EARRINGS AND SOME SUPER GLUE. 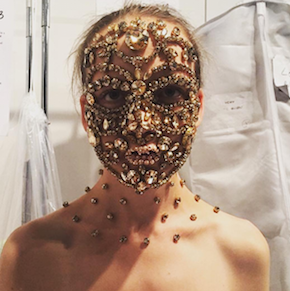 Check out this blinged out bish at the Givenchy show. And this terrifying tribal mask that has haunted my dreams since I saw it on Insta. I mean maybe with the right outfit, it could be cool for a first date or something…? And how about this pearl (and lace?) situation I can only describe as Black Swan meets Hobby Lobby. But you gotta’ love classic Southern charm. 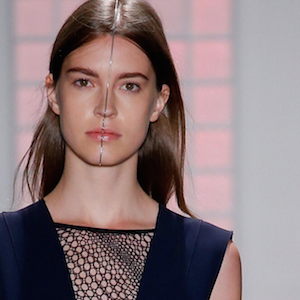 And if that’s not creepy enough, everyone was buzzing about this silver face divider from the Dion Lee show because who doesn’t like to look like a walking before and after photo? Clearly that’s impractical because you can’t open your mouth (I can think of some people I’d like to give it to), but the general idea could surface in some way in the next few seasons (maybe??). 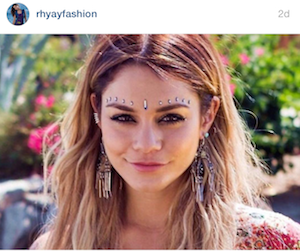 I can see this Hindu-inspired look becoming a thing especially at festivals, and potentially replacing the flash tat craze. 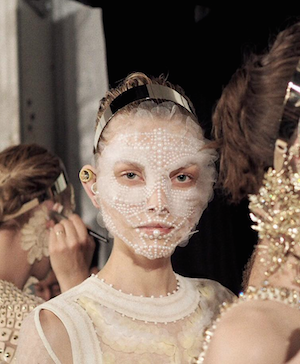 Again, no one outside of runway shows (or high-class robberies) is going to wear a full jewel mask on the streets, but I think some sparkle around the eyes and forehead/brow line could be cool for the right occasion. For where to purchase, check Bindi World, Etsy, and even Claire’s (all the 14-year-olds are doing it). I can’t feel my face when I’m with you because of this glue……but I love it.